Bissetii is a great medium height bamboo plant for a cold hardy bamboo screen. It is tolerant to most all planting sites and conditions. A very cold hardy green bamboo. Order within 20 hours 48 mins and your order will ship Tomorrow! Most tolerant of adverse growing conditions, such as wind, cold, and drought. Aggressive grower provides a fast privacy screen. 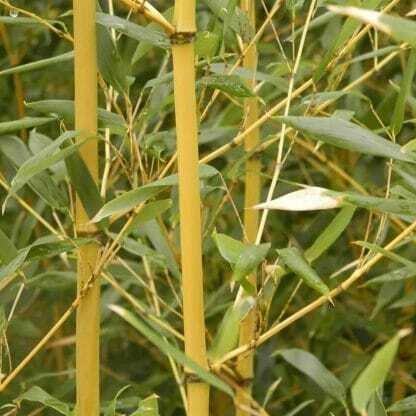 Obtains a darker green cane and foliage than most bamboo species. Phyllostachys Bissetii is a very cold hardy vigorous grower with dark gray green canes for screening. Likes most all sites and soil conditions. The culm (cane) sheaths’ auricles and oral setae are present with a narrow blade. Mature culms are erect and usually in the 16 to 18 foot height range. 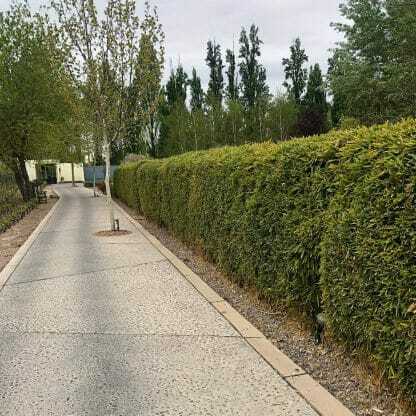 Has a very dense dark green foliage making it an excellent choice for privacy and windbreaks. Bissetii originally came from Sichuan, China was introduced to the United States in 1941. We have thousands of customers throughout northern climate zones growing this little beauty for an effective privacy screen. In USDA Climate Zone 7 expect mature size canes to 30+ feet in height. In USDA Climate Zone 6 expect mature size canes to be 18 feet in height. In USDA Climate Zone 5 expect mature size canes to be 12 feet in height. In USDA Climate Zone 4 expect mature size canes to be 8 feet in height. The culms (canes) are a beautiful green within the grove. Culms receiving more direct sunlight often turn a light golden color. In more shaded areas, the bamboo is a dark and lish green. Bissetii is one of the most cold hardy species growing in North America withstanding temperatures down to -15 degrees F.. The root system, when mulched properly, will handle temps down to -25 degrees F.
Since it is so cold hardy it is grown in many colder regions of the country such as climate zones 4 and 5. Even during severe winters this little bamboo, once established, will pop up beautiful new canes in the early spring long before other plants even turn green. Fast delivery, great specimensGot my shipment literally 19 hours after order placed. Very nice, taller and fuller than expected plants! Dense foliageOrdered 1 Bissetti fall 2017. New canes this spring (2018) Lush green leaves on entire cane. Zone 5. Highly recommend bamboo fertilizer- can really tell a difference! BestOk here's the story.....LEWIS Bamboo is awesome to do business with. They took great care of us in every way. They are true professionals. We bought a trailer load of plants and drove north to zone 6. We got instructions on how to plant, fertilize and care for these great plants. We had purchased many varieties per their suggestion just to see how they would make it in our area, ....so this was going to be an experiment. We followed their instructions precisely. We had been told not to expect much the first year. The fertilizer, mulch, and water proved to be explosive for them all. Some of the canes were pushing 3”diam . by the second year and twice the height of the house. Wow . Then a hard winter hit us. It appeared to kill them all....they all turned brown so I cut down the entire grove. By mid March we had hundreds of new shoots. We actually lost none and had a bunch of beautiful bamboo cane for build projects. We have enjoyed these plants for 7 years now and have become bamboo enthusiasts. The most aggressive, fastest growing and most indestructible of all the varieties we purchased is Bissetii. Some of our Bissetii has run over 35 ft. If you want quick....(2yr)...screen, this is a great plant. If shoots go where you don’t want them , just kick them off or mow them.....easy to control. The one star rating was to get your attention. Our experience with this company was exemplary!! Fantastic CompanyReceived 1 of my 2 Bisetti plants in just a few days. Great packaging and plant was in great shape. But the other was missing. Contacted customer service and Rachel Lewis (I believe ) called me less than a day later and told me they would get right on it. A day after that, all the while keeping me informed via email, and phone calls, the lost plant was on its way. I have never dealt with a company that responded that courteously and quickly. Kudos to you at Lewis Bamboo! And the second plant arrived in beautiful shape as well. Nicely doneOrdering was easy, arrived well packaged and in top condition. Plants are thriving and I'm very satisfied. Thanks! Received my three Bissetii Bamboos today...Received my three Bissetii Bamboos today. Man, that was fast! They are beautiful right out of the box, and I can't wait to get them in the ground and see what they can do. Thanks so much for such fast delivery and excellent plants. My first order of Bissetii a few years back did so well, I just ordered some more to screen a retaining wall in my back yard. As with the first order, the plants arrived in great shape and packed very well. Lewis Bamboo has been super helpful and the folks there have answered my many questions. I definitely recommend ordering from them. 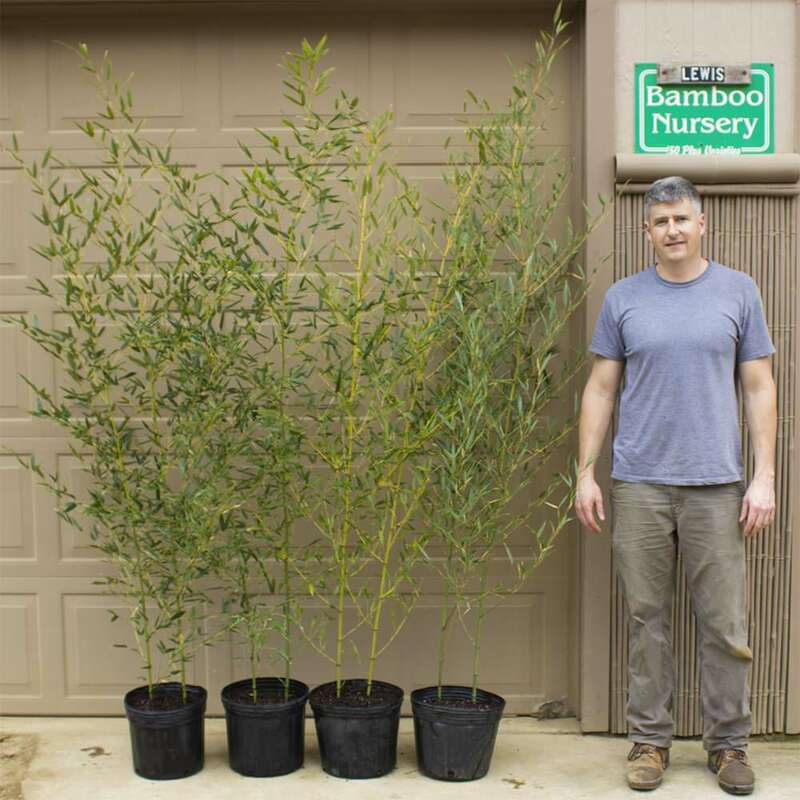 Phenomenal service and productsWe purchased several bamboo plants from Lewis Bamboo. The quality of the service is second to none. We had them shipped all the way to Pittsburgh and they arrived in perfect condition. They took to the climate extremely well. They've been thriving ever since we planted them! Bamboo ReviewLooked beautiful upon arrival. Packaging was great. Planted within 2 days of receipt. Looked good and then we had a very cold couple of days (near zero). They turned brown and have looked miserable ever since. I don't think they are dead, because the stems are still greenish. I'm hoping I'll see new growth with the arrival of spring. I like the sound of the breeze blowing through the brown leaves, which stayed on the stems. They are going to be great if they live through planting! My favorite bambooI live in SE Michigan, and this is the best type for cold-hardiness and screen. it was very healthy when it arrived & it still is!!! 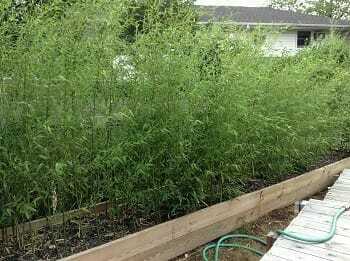 survived the summer drought pretty well..
Great bamboo. I planted it in a huge, wooden planter at the corner of the garage, and it has really thrived. We'll see how it does over the winter, here in lower Michigan. I plan on buying more, and also more Nuda, which is also great. Bamboo arrived as promised. It has been in the ground since 8/13/2016 and looks great. If it over winters as well as the other bamboo we purchased in 2014, we'll be very pleased. Your plants are quality and we would recommend your company. We received your bamboo on Thursday and cut open one side of the box to let them breathe and gave them a little water. They are lovely plants! We prepared the planting area on Saturday and fully removed them from their box and planted them according to your web site directions. They are much taller than we expected and they already look great in our garden area!! I purchase the cold hardy bamboo last spring. It arrived quickly and was beautiful all summer. Survived most of the winter and then in early March we had an exceptionally cold week of arctic air, the leaves turned brown and fell off. I was so upset. BUT by April my little bamboo came alive again and turned into quite the bush. It is now sending out runners which I'm trying to direct where I want them to go. The plant is happy and healthy, with some really fat runners that I struggle to bend in the proper direction. Very happy with my bamboo. And cannot wait to see what it does next year. My bamboo came delivered as promised, it's beautiful! I planted mine in a planter, looks so good I had to get two more. I'm very happy with my purchase from Lewis Bamboo. I searched for ages to find a bamboo retailer that didn't charge an arm and a leg for shipping. But with Lewis Bamboo, I got a great, healthy bamboo plant shipped to me for FREE within just a few days. The bissetii arrived very healthy. I got it planted in a large container in my sunroom and it's already taking off, growing all kinds of new leaves. I would highly recommend Lewis Bamboo to anyone interested in these beautiful plants. I look forward to ordering again as soon as I can find room for more! I order on 8/15 and the bamboo was shipped the same day, impressive. The crappy part was that UPS delivered the package to the wrong house. UPS denied the claim. Lewis Bamboo did a follow up. It took them over 2 weeks before they finally issued a replacement. Good responsive service. I am satisfied with my order and it came quickly. All Wonderful no problem at all. Thank you! I purchased a P. Bissetii from you last month. I was very impressed with the packaging and the plant is doing great. Loved it so much that I had to have another. Keep up the good work!! This is one of the best places to buy bamboo from!!! The packaging is fantastic..and the plants I got was twice the size of the box!! I will definitely buy from Lewis Bamboos again...Also there instruction were so helpful. Thanks for the advice in selecting the P. bissetii as the next choice in my bamboo plantings. I had for some reason thought of it as sort of an also-ran. What I received is a lovely, bombproof bamboo that will handle anything my climate can dish out with zero difficulty. 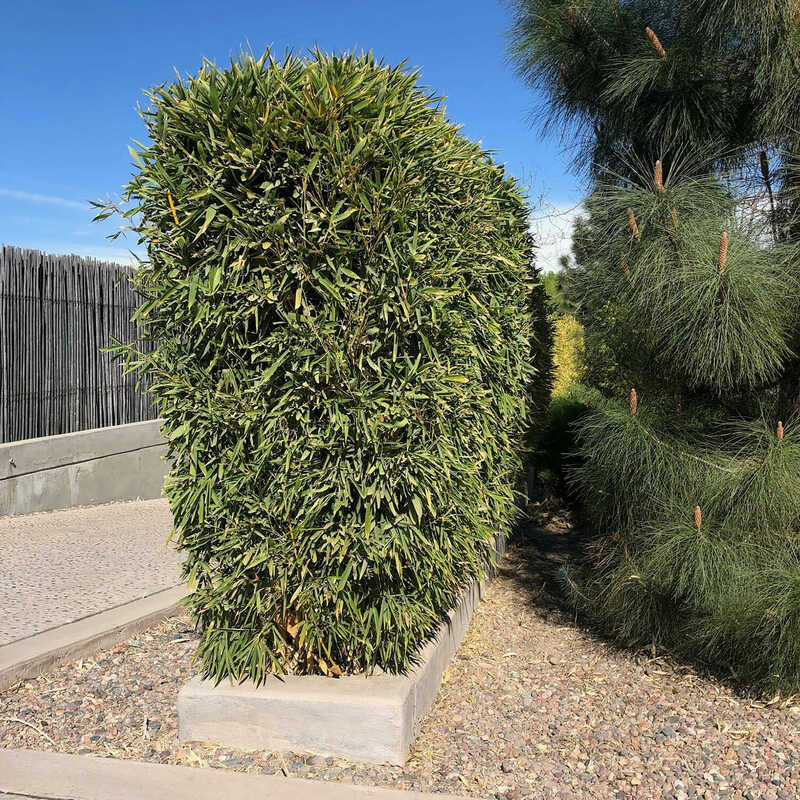 The foliage on the bisseti has a slightly different color from the many other bamboo varieties in my collection, as do the culms, and I am very pleased with it. It already stands out, and I am anxious to see what it will do. My P. decora is going nuts right now, extremely attractive and growing almost as tall as my "Moso", at least this year. The "Moso" has really gone crazy, a solid wall nine to 10 feet tall, and maybe 30 yards wide, from only four 3 gallon plants that experienced top kill their first winter here. I am hoping they survive southwest Virginia, but there is P. rubromarginata in the wings if they fail. P. viridis glaucescens is really shooting vigorously just now too. Thanks again for all you do! 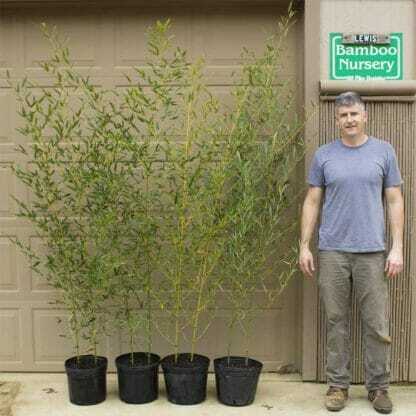 Q How many bamboo plants come in the different sized pots? Bamboo grows a little different than most plants. The bamboo that you get initially never grows vertically again. It has babies that are taller, that has babies that are taller. Every generation should be taller that the previous year's shoots. The intriguing aspect is that each year’s growth emerges and grows to it complete height in 60-90 days. They spread as they produce larger growth, filling in and providing a screen. Planting bamboo is also easy. You want to dig a hole about twice the size of the root ball. 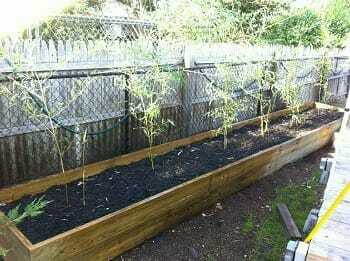 When you plant the bamboo amend your soil with composted manure and a good top soil. Bamboo can be planted at ground level or slightly deeper. It is not a picky about it conditions but this will help get it off to a good start. One division of bamboo will start a grove or screen over time. However, if you want a privacy screen fast, I recommend planting bamboo 3 to 5 feet apart. This will hopefully allow you to have a good screen in three years. There are a lot of factors such as water, sunlight, and climate zones that speeds up or slows down the process. Three years is about the average on this spacing, closer planting will allow you to screen or develop your grove faster. You cannot over plant bamboo. 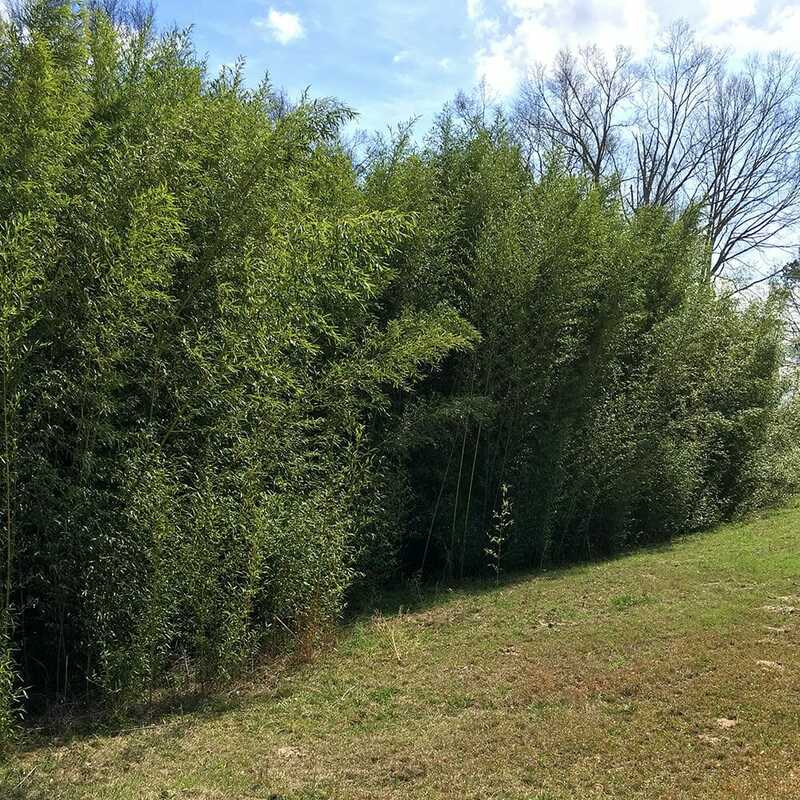 Over the years a lot of myths have been told about bamboo, while it can spread under good conditions, it is not as invasive as many people would have you believe. In colder climates an aggressive runner here in the south will hardy spread at all in comparison. We have been growing bamboo since 1985 and had experience with it long before that. The bamboo's underground root system (rhizome) will spread beyond the initial planting over the years, so in the next two or three years you will need to decide on some method of containment on the sides you do not want the rhizomes to run over into. All this said and it may discourage you, but as with any plant there will be maintenance. Bamboo is very beautiful and is great in a Japanese style garden, but it will need maintenance down the road. At first it may seem to be doing nothing, but after 3 to 5 years you will have a lot of beautiful culms (canes) and love the foliage. All our 150 plus species simply contained by mowing and weed eating the new Spring and Summer shoots. Hopes this helps and don't be afraid of the bamboo.